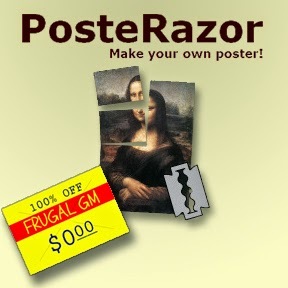 This week's Free GM Resource is a useful tool allowing you to print out your own poster-sized graphics files at home. I'm not sure if you've ever priced out large-format printing at FedEx Kinkos or your local office supply store, but it isn't cheap. Black 7 White isn't too bad, especially for a special project, but color printing....right out unless somehow you have your players paying you to GM. If that is the case, please let me know where to sign up! PosteRazor basically lets you set the parameters for taking a large file and slicing it up into smaller pieces that you can stitch back together once it has gone through the printer in a more manageable state. You can set paper type, amount of overlap, borders.....it has it all. The creator even has a little demo YouTube video, but I didn't think it was necessary to post it here.